Here is the Google Drive. Finally. And my worst thoughts about it came to life. But let's start with the good things: Google Drive is here. 5GB for free. The bad imho is, it's integrated in your Docs storage. Nope wait. Google Docs is ousted. It's now Google Drive. The old Docs storage plan, with those good prices? Gone! I don't know where to start. It's a disaster in my eyes. 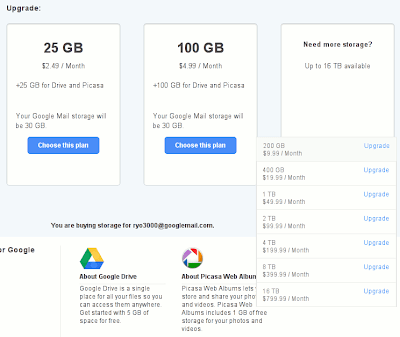 Instead of having 20GB Docs storage for $5/year, you can now choose 25GB for $2.49/month(!). 30GB for GMail is separate. While this is not so bad, if you want a REAL Drive you need Terabytes of space. The competition, Livedrive e.g., is offering UNLIMITED Backup space for 5 PCs and an additional 5TB(!) Drive to sync across all devices, including Android phones for $24.95/month. 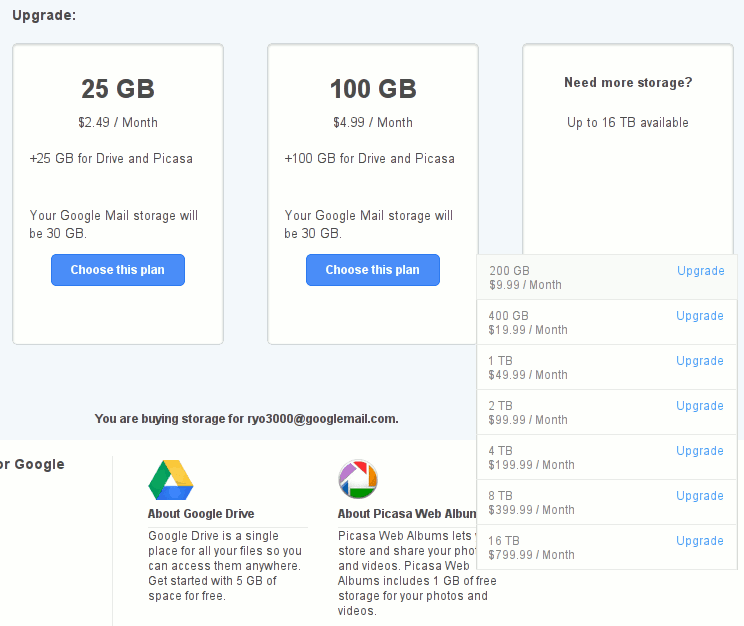 The Google Drive offers 4TB for $199.95/month(!) with no unlimited backup space. So all in all you could say, your old Google Docs Storage got more expensive now, with a client for PC and Mac. NO GNU/Linux at the moment. Livedrive offers at least SFTP and WebDAV for Linux-Users to have at least a virtual drive on their desktop. And really, Google Docs is now Google Drive. No kidding. Docs is now a folder and file oriented system. Not like the Docs before. The Android-App is no more. It automatically updates to Google Drive basically to an file-manager with an editor. This is not as bad as it sounds, but if you got used to your Docs, this is totally different. I think there will be said a lot more in the next days and weeks. I really need to understand what just happened. For now one thing is sure: Google Drive will not be my place for cloud storage. It can't be. It's way, way too expensive, has no real backup, and is not usable with Linux the way most other services are. I already believed it can't compete with real cloud storage services like Livedrive or Carbonite, but this is completely off the track. This is a better USB-Stick for monthly cost.